ysabetwordsmith | Poem: "Trail Magic"
This poem is spillover from the January 19, 2016 Poetry Fishbowl. It was inspired by a prompt from LJ user Book_worm5. It also fills the "smoke" square in my 10-1-15 card for the Halloween / Samhain Bingo fest, and the "dinner out" square in my 8-1-15 card for the As You Like It Bingo fest. This poem has been sponsored by Anthony & Shirley Barrette. It belongs to The Moon Door series. to multiple sclerosis eroding her health. and plants that she found along the way. with increased pain and decreased function. pushed her in a wheelchair. even though she didn't want to. and the little pocket parks. "I'm going for a walk,"
you're welcome to come with me." The other woman shook her head. it didn't end well," said Randie. she loved being a werewolf. to longer and more challenging. to create a longer walk. from the full moon, perfectly safe." of river and feeder creeks. many of them were steeper. in the feel of her body. and trail mix that she carried. were starting to look ... tempting. which served as an oven. cooking meat and something sweeter. were not altogether without cause. "Hi there," the fellow called. "I'm Amos. Would you like to stop for some food? I can eat, so you're welcome to it." sitting down on a log seat. a day hike?" he asked gently. ate it all, and I'm still hungry!" works up a strong appetite." so I couldn't get out very much. when your body changes on you,"
Amos said with a knowing nod. "So very true," Hilla agreed. from the coals of the campfire. as he handed her a fork. "Tuck in." and she squinted as it stung her eyes. "The food is fantastic," she said. "Thank you so much for sharing." digging industriously in the coals. "Wait until you see dessert." in petals of charred foil. feeling like a complete mooch. in return for you feeding me?" she asked. my water jugs; I'm about out," said Amos. a hand pump for clean water." in hand, and pumped them full. athletic now than before she first got sick. to make her more of herself. Hilla said, "I hope this is enough." "It's plenty, thanks," said Amos. as by the delicious food. "I didn't roll in anything,"
it sure is nice to have it back." or have to ask for," Hilla said. maybe I'll come with you,"
"I'd like that," Hilla said. Trail magic is unexpected, but welcome, help or food. Hilla has pale skin, dark blue eyes, and short white-blonde hair. Hiking is a fun hobby with many benefits, whether you go alone or with company. Know what to take when you go hiking. Trails can be found through various guides. You can also make your own, especially on private property. Trail activities include birdwatching, identifying plants, and learning geology. Educational apps for a smartphone are lighter than a backpack full of field guides! No, they will NOT make you lazy, people learn through repetition. If you keep pointing your phone at things to identify them, eventually some of that info will stick. 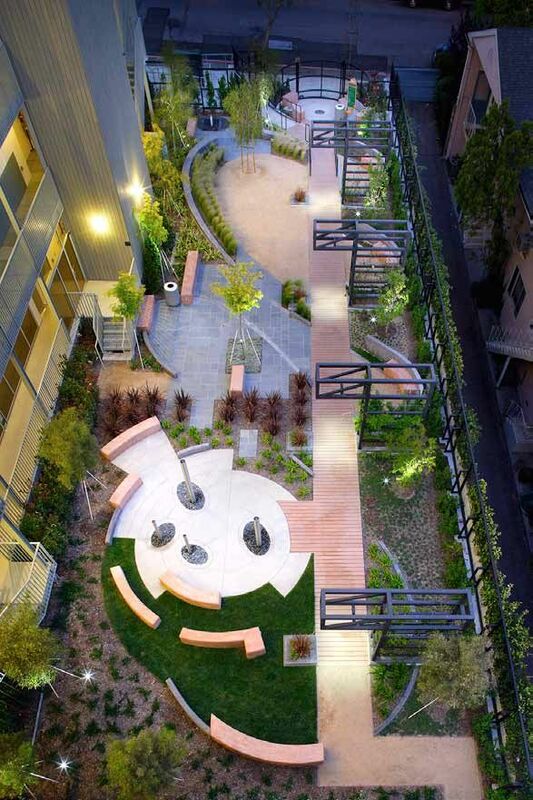 Pocket parks are small green spaces in a city that service an area of just a few blocks. The one by the hotel looks similar to this. A neighborhood park may have a modest network of interconnected trails, each one only a fraction of a mile -- but if you walk along the linked network, the distances do add up. Anxiety, depression, and other problems can lead to social isolation. Randie's safety concerns are valid, but her coping methods are not ideal. There are ways to overcome social isolation. Among the best ways to help a depressed or anxious friend to reconnect is simply to keep asking. They may only accept 1 out of 10 or 20 invitations, but every one is a win. Large parks may have miles of meshed trails, usually with different levels of difficulty. Sometimes they are divided into trails for walking, mountain biking, and/or horseback riding. Wolf packs have extensive territory. Their anatomy lends itself well to traveling long distances. Wolves have ground-eating gaits, and for werewolves, that carries over somewhat into human form. Trail food for day hikes includes homemade snacks such as trail mix and jerky. Many werewolves adore jerky because it is pure meat and fulfills the chewing urge. 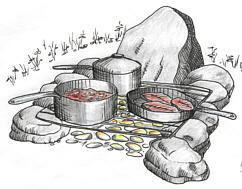 Campfires may be made in an impromptu stove of stones. Campfire cooking has its own techniques and recipes. Tinfoil is indispensable for making main dishes such as sausage packets. It also works for desserts like roasted peaches. Drooling is associated with some dog breeds, notably Alaskan malamutes who are very wolflike. It can also happen to humans, especially people with multiple sclerosis. Some werewolves have increased salivary response even in human form; it's not a defect, just a quirk that can be embarrassing. Hilla knows about MS drooling but never had to deal with it, because her disease manifested in arms and legs instead of her head. There are ways to deal with day and night drooling. Amos -- He has fair skin, blue eyes, and gray hair. He enjoys hiking, camping, and cooking in the wild. He always makes more food than he can eat, and invites strangers to share it. Parks often install a hand pump near a natural water source, as a way to provide water that meets sanitary standards. Takes a bit of elbow grease to get your water out, but not much when the water table is right below the surface, and it requires no electricity. Amos-- I hope to see more of him, VERY much so. Randie could use someone with his easygoing acceptance, and practical nature. :D Yay! Feel free to prompt for him. Amos clearly spends plenty of time in a place that Hilla also likes and Randie might venture into. Agreed. There's another hiker in the support group, too. • you're welcome ^ come with me." >> • you're welcome ^ come with me." Finally it works. Thanks. Nice stove, if you can carry the grille. There are collapsible grills. This one makes a whole portable cooker, but you could carry just the folding grid for holding the food. What do Hilla's doctor and health aide think about this? It's an amazing recovery from a disease that should only get worse. What happens if somebody lets something slip in church*, or to the media? * This could go either way -- if the lycanthropy isn't discovered, it will be hailed as a MIRACLE FROM GOD!, but if it is... we could be looking at the return of witch-hunts. They don't know yet. Randie did the same thing with Hilla that her maker did with her -- an unexplained disappearance. Hilla has been busy adjusting and hasn't tackled that mess yet. At some point she'll probably have to reappear officially. But being a werewolf creates a lot of tangles that are, honestly, easier just to deal with by ghosting through society instead of trying to form solid ties. Randie's standoffish behavior isn't unfounded. >> It's an amazing recovery from a disease that should only get worse. What happens if somebody lets something slip in church*, or to the media? Exactly, and at some point, it is going to slip out simply because they've decided to start sharing lycanthropy as a radical treatment for chronic illness. That's part of the natural arc in this series. Hilla does have an advantage in that she had relapsing-remitting MS. She can theoretically say that she's had a huge remission and feels fine for now, and if it flares up again she'll deal with that at the time. This is not going to be an option for people with some other disabilities. If a person regrows lost body parts, that is very conspicuous. Amusingly, the hunters in this setting are not very effective. It's what you get when ignorant people go haring off after things they don't understand: a few injuries and fatalities, but it just isn't that hard to outthink idiots. Plus the werewolves are stronger, faster, tougher, and much better at teamwork. Even a big gun can only "equalize" so much. So that changes the kind of stories that can be told. Sounds like, by the time the hunters get organised and knowledgable enough to be a more credible threat, there might be more acceptance of lycanthropy too? That would also affect the kind of stories available. Yes. There will be more acceptance because the werewolves take control of the framing. They're expert communicators on the topic of chronic illness. To them, lycanthropy is a disease, which just happens to replace most other diseases. So they're parsing it like any other radical treatment -- it has advantages and disadvantages, so you just weigh your current parameters against that to see if it would be an improvement. Harassing or killing people for having health problems is just wrong. I think Randie is wavering toward giving it a try. She seems enthralled by the smell of campfire cooking. >> I also loved Amos. I hope we'll see more of him too. Easy enough if folks are interested! Mmmmm, campfire cooking. Mmmm, hiking and beauty. I'm glad Hilla gets to have a good time in this one. This series includes a range from really intense stuff to fluffier pieces like this. The more hurt, the more comfort. I'm happy that it worked for you. Sniffsniffsniff, campfire smoke... *earperks* the sound of a water pump being primed... ooh, well-groomed trails that aren't blacktop... now I'm reeeeally wishing for June. This is lovely. Hmm, what does Amos know? As in, that line about when your body changes on you is potentially telling. About what isn't clear yet, but it makes me wonder. :D I like hiking too. I'm glad that my sensory descriptions came through so well! He's old. He has survived various injuries and illnesses, and adapted to the parts of old age that won't go away. He's seen other friends go through physical challenges too. Amos also understands the healing power of nature. So he's seen it before, when someone is sick for a long time and later they go back out hiking, but things have changed so they goof up before they get back into practice. This process is much easier and safer if other hikers give them a hand. That is probably a useful discussion for them to have, especially if Amos meets any of Hilla's other friends. His experience is different from theirs, but they all have plenty of skill in body-coping. My guess is one of his limitations is that it's harder for him to lift and carry heavy things than it used to be, especially for any length of time. So he can carry a pack, but hoofing a lot of water is tiring for him now. Thus making friends with Hilla would expand what Amos can do, if she's willing to haul water for him. Since Hilla enjoys working her body now that she can, it's a good match. Amos reminds me of my street friend Norman. Always cooking for more than just himself. :D The pump does not require priming, just put your shoulder into it. But I love that song, and have noted it for possible future use. Yes, exactly. They don't try to change him, just be his friend. The effects are stronger in wolf form, but spill over a little into human form -- just as human thoughts drift into the wolf. With practice it's possible to control the proportion more. I like this! I'm glad Hilla's feeling well, and hope she can continue to help Randie, and maybe pass on some of that joy. I'm happy to hear that. Yes, Hilla will keep working with Randie as best she can. apropos of nothing, I'd heard "trail magic" as any gift - which might be a sudden appearance of great beauty, or sudden renewed appreciation. An unexpected offer of aid of any sort is also a sort of magic - and it sounds appropriate. A story I once read discussed a man having a bag of "super raisins" because they were all he had and he had been hiking a long time, and was really hungry. Help offered when one realizes one truly wants it would have the same quality as sudden beauty or awareness in the trail. The wider definition seems applicable. I was just going based on the glossary at hand. I have heard that! It's a wonderful piece. Also very true. There are lone werewolves in this setting, but as with natural wolves, it isn't very good for them. Randie is better off now that she has other people around her again. dialecticdreamer - I love this!